Once upon a time, I decided it is a good time to upgrade the version of gcc compiler we use in our ARM926-based firmware project. Historically, this project uses gcc version 4.6, which is quite outdated nowadays (January 2018). In a different project, built around ARM-Cortex, we already successfully use the gcc version 5.4.1 (Linaro release in January 2017), so I wanted to upgrade our ARM926 project to this newer gcc version. It seems as if all symbols are shifted around, and nothing quite matches up. Running the code comes to a crash somewhere in the startup. The new compiler toolchain inserts a special unique build-ID to the output binary, and if it is explicitly not told where to place it, it ends up in the worst place possible – before the start code and right in the interrupt vector table. We have already fixed two problems: the assembly syntax problem, and the linker build-ID problem. The third problem is the most puzzling one: the program starts and runs correctly, but after the first interrupt is served, no further interrupts are ever served. The processor happily continues running the main application code, but no ISRs are ever entered again. Yet the identical code compiled with the old compiler 4.6 works perfectly. What could be a problem now? Perhaps you see the problem right away in the screenshots, but it took me half a day to spot it. Look in the last picture in the right window labelled ‘REGISTERS’. 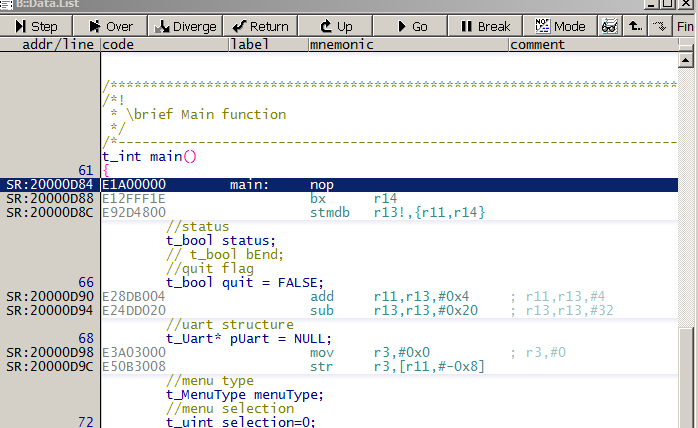 The left-most column in the REGISTERS window shows from top to bottom the processor flags (N, Z , C, …) and after that the processor state. It shows the processor is running in the… IRQ state! Yet the program counter is already back in the main application code. So the character ‘^’ is a special suffix that must be used exactly at the return from ISR. But the new code generated by gcc-5.4.1 uses the normal return with ‘pop’! Now it is becoming clear why only the first interrupt request is ever served. Due to a software bug in our ISR epilogue the processor does not recognize that ISR has ended. The CPU remains in the IRQ state even after a formal return to the main application code, and thus it cannot receive any further IRQs. At this point, it is a good idea to simply test if another compiler works better. And yes, in gcc-7.2.1, which is the current newest Linaro release in January 2018, the code works yet again well. We evidently have hit a bug in gcc-5.4.1 in its ARM926 ISR code generation path. compiler bugs exist, but they are subtle, and can bite unexpectedly.